ProductsNutricosmetic supporting healthy-looking hair and scalp. The ingredients start to repair and condition your hair from day one. From the follicles to the very ends. The unique formula Nutri-Amino Complex™ makes hair stronger, faster growing and fall out less. Hairvity also promotes healthy scalp which is one of the conditions for healthy hair. It does not matter what the reasons for your bad hair condition are. All you need is 2 Hairvity capsules a day to enjoy healthy-looking hair! Take the product for a minimum of three months and the results will surprise you! The results have been confirmed by men from all over the world. The customers' hair became healthier, thicker and easier to style. The product also reduced hair loss. the problems disappeared. Lately I've even noticed some new hair growing. Awesome! I started taking those capsules I haven't had a haircut. I wanted to see real results. My hair grew, it looks healthier and doesn't fall out like it used to. I like my longer hairstyle. I think I'll stick to it for some time. Why Hairvity delivers such good results? Our secret is the unique combination of ingredients. The key to healthy hair is on the inside. Hairvity uses safe and natural ingredients with proven results to help maintain naturally beautiful hair. This combination of crucial vitamins and microelements has been created for that goal only. A 3-month treatment will already ensure healthy, shiny and thick hair! Saw palmetto fruit extract aids men to grow healthy hair and helps fight dandruff. Ashwagandha root extract has a positive effect on the scalp. Biotin gives hair more body, slows down graying and improves the overall condition of hair. Sulphur is necessary for maintaining healthy collagen and keratin levels. Vitamin E accelerates hair growth. Zinc improves the general hair condition and structure. Copper strengthens hair, leaving it resilient and elastic. 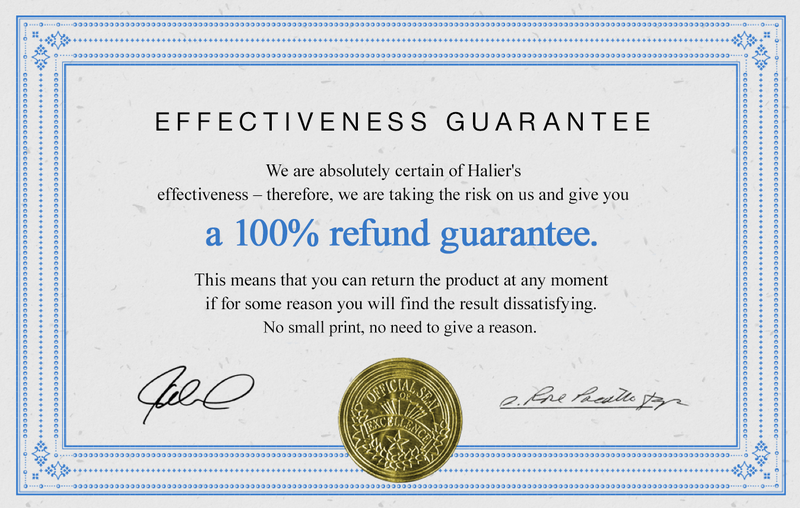 We are certain of effectiveness of Halier products. Your purchase is risk-free. Try Hairvity without risk with unconditional money back guarantee. We are certain of our products' effectiveness. Therefore you can return the product within 90 days if you think it has not fulfilled your expectations. We will refund you the purchase in full. My wife got me Hairvity Men when she was buying Hairvity for women for herself. Our hair has changed so much! The difference is huge. Hair doesn't fall out and grows faster. We totally recommend it! Before I started using Hairvity Men my hair fell out like crazy. It was everywhere - in the sink, in the shower, even on the kitchen floor! Hairvity strengthened the follicles and the problem is gone. I'm a hairdresser and I know all the supplements with biotin and collagen. Many customers ask me for my advice and opinion. Men are now aware that not only women should take care of their hair. I tested Hairvity Men myself. I think it's the best nutricosmetic on the market. It has great blend of vitamins and minerals which can't be replenished with diet. I have an impression that my problems with receding hairline and losing hair appeared so suddenly. My hair was also thinning on the top of my head. I was scared I was going bald! I was looking for some miracle product to help me. The shop assistant suggested Hairvity Men. She told me she used Haivity for women. So, I bought Hairvity Men. I'm taking it now and I can see the difference. It saved my hair! Hairvity Men did wonder for my hair. My scalp was dry and I had bad dandruff. Now I can see the results of taking the capsules. My hair looks healthy, thick and there's no sign of an itchy scalp. I've been taking it for 3 months. I noticed first baby hair, so Hairvity Men really works! Until now my hair was just terrible. I used to shave my head so no one noticed the receding hairline and baldish patches. Hair was always my biggest complex. I hated all the jokes my friends made about my hair. My girlfriend knew that too well and she got me 3-month supply of Hairvity Men. My hair started growing faster. For the first time for many years I decided to grow it again. I'm really surprised and happy! I can't wait to have real, cool hairstyle again. It also makes hair thicker and reduces hair loss. Sulphur is necessary for maintaining healthy level of collagen and keratin which are responsible for proper hair growth phase. Sulphur also makes this phase longer. It has a beneficial impact on the scalp. It stimulates hair growth, improves skin microcirculation and works as an antioxidant. It boosts hair volume, prevents early graying and improves the condition of weak and prone to breakage hair. Biotin also maintains right hydration and helps produce keratin. It makes hair thicker and stronger. It promotes healthy hair sturcture and is known for its antifungal and antibacterial properites. Strengthens hair, making it flexible and strong. It also determines hair colour. Ingredients: L-Cysteine hydrochloride monohydrate; beef gelatin; saw palmetto fruit extract (Serenoarepens) DER 4: 1; hydrolyzed fish collagen; Ashwagandha root extract (Withaniasomnifera) DER 4: 1; L-methionine; zinc gluconate; mixed tocopherols (vitamin E); L-leucine; hyaluronic acid 90%; bulking agent: maltodextrin; methylsulfonylmethane / MSM/, anti-caking agents: magnesium salts of fatty acids, silicon dioxide; pigment: titanium dioxide; copper gluconate (II); sodium selenite (VI) ; D-biotin. Results: Hairvity Men is an advanced product dedicated to improving the condition of your hair and scalp. 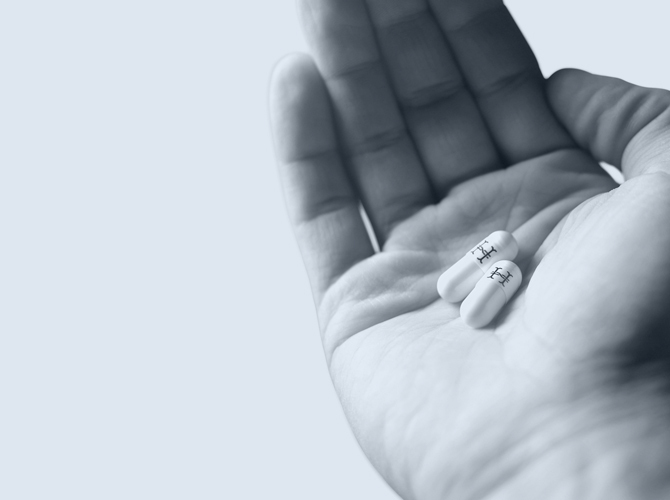 The ingredients of Hairvity capsules (Ashwagandha, biotin and saw palmetto) greatly benefit the skin, aid hair growth and help form follicles. Important information: Do not exceed the recommended daily dose. Dietary supplements cannot be used as a substitute for a balanced diet. Healthy lifestyle and healthy diet are recommended. Do not use if you are allergic to any of the supplement's ingredients. Not recommended for pregnant or breastfeeding women or children under 18. Hairvity Men is a complex product for men which promotes healthy hair and scalp. The formula has been enriched with important amino acids contained in NUTRI-AMINO COMPLEX™ formula. The ingredients of the capsules (ashwagandha, biotin and saw palmetto) improve skin condition, promote healthy hair growth and help form the follicles. Can anybody use Hairvity Men? Hairvity Men is a safe product. If you wish, you can consult taking the supplement with your doctor. How long should I use Hairvity Men? Hairvity Men starts to improve the condition of your hair from day one. For optimal results, use it for minimum 3 months. After that time Hairvity will work wonders on your hair and you will feel the difference. What are the ingredients of Hairvity Men? The ingredients of Hairvity Men are: L-cysteine ​​hydrochloride monohydrate; beef gelatin; saw palmetto fruit extract (Serenoarepens) DER 4: 1; hydrolyzed fish collagen; Ashwagandha root extract (Withaniasomnifera) DER 4: 1; L-methionine; zinc gluconate; mixed tocopherols (vitamin E); L-leucine; hyaluronic acid 90%; filling agent: maltodextrin; methylsulfonylmethane /MSM/, anti-caking agents: magnesium salts of fatty acids, silicon dioxide; pigment: titanium dioxide; copper gluconate (II); sodium selenate (VI); D-biotin. Does Hairvity Men work on hair only? No, Hairvity Men is an advanced product which maintains healthy-looking hair and scalp. You might also notice the improvement in the condition of your beard. How long does one packet of Hairvity Men last for? One packet of Hairvity Men contains 60 capsules and is enough for a month of use. Does Hairvity Men cure baldness? No, Hairvity Men does not cure baldness. The ingredients contained in the capsules (Ashwagandha, biotin, and saw palmetto) maintain healthy scalp, boost hair growth and help form hair follicles. Where can I buy Hairvity Men? Hairvity Men can be purchased via our online shop www.halier.co.uk, in selected hair and beauty salons and stores throughout the country. How do the guarantee and 90-day return policy work? We are certain of our products' effectiveness. Therefore we offer you 100% money back guarantee. You can return the product within 90 days if you think it has not fulfilled your expectations. The orders are processed within 2 working days. The products are delivered in a smart package by a renowned courier company. Certainly. Having our customers' needs in mind we offer free delivery to a country of your choice. Delivery time may vary.